Manufacturer of a wide range of products which include pool pump strainer, pvdf basket strainer, pvdf y type strainer, upvc bag filter, lined basket strainer and bucket strainer. One Piece molded Strainer. 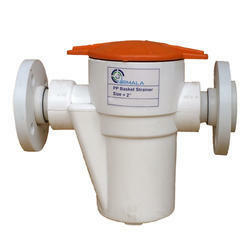 Most useful for Pool Pump Strainer in Indian Market. Size/Dimension 1 " TO 4"
We are one of the leading manufacturer for pvdf y type strainer. size availability : 1" to 4"
body and flange : full pvdf . inside element : ss 316 , ptfe. recommended for bromine and highly temp application. 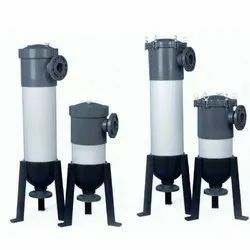 We surve NIRMALA BRNAD UPVC BAG FILTER. UPVC Offers good resistance to UV and Atmospheric Oxygen. Molded Construction leads to good mechanical strength. Fluoropolymer Lined Basket Strainer for the most demanding chemical applications to suite ASME Class 150 piping systems. Strainer body is made of Ductile Iron lined with PFA/FEP/PVDF. The basket is made of molded fluoropolymer with PTFE sleeve that locates an ETFE fine mesh. Size 1.5 " To 4"
Dia 3/4", 1", 1*1/2", 2", 3", 4" , 6", 8", 10"
Manufacturer and Suppliers of Moulded Basket Strainer in PP. Moulded Basket Strainer in PP in many corrosive or sensitive process media straining applications, plastic is the preferred material of construction for a basket strainer. 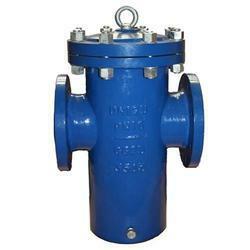 Moulded basket strainers are resistant to wide variety of corrosive acids and other aggressive materials. They will work in applications that may require a much more expensive exotic alloy - if one were easily available. Their plastic constructions ensure that they will not contaminate sensitive process media such as photographic chemicals and de-ionized water. Available in screwed as well as flanged connection. Hydraulically tested to 5 kg/cm. No painting or coating required to survive a difficult environment.